The Horseshoe Falls is the most powerful waterfall in North America and every year, millions of visitors venture to Niagara Falls to experience its breathtaking beauty. 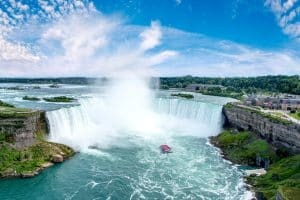 After you take in the incredible sight and sound of the waterfall on your next trip to Niagara Falls, make sure to also check out these incredibly unique water experiences throughout the city. Hornblower Niagara Cruises offers a classic and iconic Niagara Falls experience that takes you on a boat ride into the mist and up close to the American, Bridal Veil, and Horseshoe Falls. You can choose from a number of different boat tour experiences including the classic daytime Voyage to the Falls Boat Tour, Voyage to the Falls Evening Boat Tour, Falls Illumination Cruise, and the Falls Fireworks Cruise. Downstream from Niagara Falls is the incredible Niagara Gorge, which features the powerful Niagara Whirlpool and rapids. And you can venture right into the rapids on a Whirlpool Jet Boat Tour, which will take you on a fast, thrilling and excitement-filled ride deep into the gorge and right into the rapids. The 3-acre Fallsview Indoor Waterpark offers water fun for the whole family in a unique indoor setting located right down the street from Niagara Falls. You can experience 16 thrilling waterslides, a full-size wavepool, outdoor activity pool and sundeck, adult-only Jacuzzis, 1,000 gallon tipping bucket, and much more. And you can even pair your waterpark experience with a hotel stay at one of four Falls Avenue Resort hotels with a Waterpark Getaway Package. From August 25th to September 4th, you can experience the amazing Onguiaahra: Thunder of Waters Show taking place in Queen Victoria Park, directly across the street from Niagara Falls. This is a great entertainment destination for families and is an exciting performance that tells the story of Niagara with an amazing combination of water jets, lights, and music.